Entomopathogenic fungus Beauveria bassiana is known to endophytically colonize various plants and provide protection against arthropod pests. Information of such endophytic interaction of another entomopathogenic fungus Metarhizium brunneum (=M. anisopliae) is limited. A greenhouse study was conducted in 2010 to evaluate the endophytic potential of B. bassiana (commercial isolate GHA and a California isolate SfBb1) and M. brunneum (commercial isolate F52 and a California isolate GmMa1). Strawberry plants were grown in pots and fungal inocula were applied to the potting medium, vermiculite. When roots and aerial parts were periodically sampled, surface sterilized, and plated on selective media, B. bassiana grew from roots, petioles, pedicels, leaf lamina, sepals, and calyxes whereas M. brunneum was never detected from those tissues. It was initially thought that M. brunneum did not colonize strawberry plants. However, there was an accidental infestation of twospotted spider mite, Tetranychus urticae on strawberry plants meant for another repetition of the endophyte study with M. brunneum isolates. 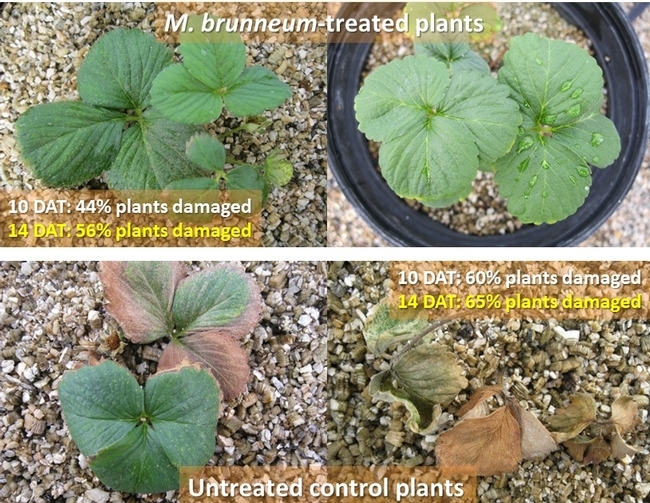 Among those plants, 32 were treated with M. brunneum isolates and 20 were untreated control plants. Treatments were administered by applying 100 ml of conidial suspension at 1X10^10 conidia/ml concentration around the base of each potted plant. Each isolate had 16 strawberry plants. Mite counts were not taken as the plants were initially intended for endophyte evaluation and leaves could not be destructively sampled. But the proportion of plants damaged by mite infestations were recorded 10 and 14 days after fungal inoculation. Plants treated with M. brunneum isolates appeared to withstand spider mite infestations better than untreated controls. Since M. brunneum could not be detected in the plant tissue in the previous attempt, it was not clear at that time how the fungus helped strawberry plants to withstand mite damage. A recent study using scanning electronic microcopy showed that M. brunneum endophytically colonized cowpea plants. It is possible that M. brunneum colonized strawberry plants, but could not be detected using selective medium technique. Another study demonstrated that B. bassiana and M. brunneum promoted the growth of cabbage plants and improved the biomass. In the current study, M. brunneum probably improved the moisture absorption in strawberry plants through mycorrhizal interaction and helped withstand the spider mite infestations which are usually worse in plants under water stress. Fungal toxins in strawberry plants might have also impacted spider mites in a manner similar to the effect of endophytic B. bassiana on green peach aphid, Myzus persicae, in a different study. Observations from the current study indicate the potential of M. brunneum as an endophyte in protecting plants from arthropod damage. Additional studies are required to further investigate this interaction. Acknowledgment: Thanks to Dale Spurgeon, USDA-ARS for providing laboratory and greenhouse resources for this study. Dara, S. K. and S. R. Dara. 2015. Entomopathogenic fungus Beauveria bassiana endophytically colonizes strawberry plants. UCANR eNewsletter Strawberries and Vegetables, February 17, 2015. Dara, S. K., S. S. Dara, and S. S. Dara. 2014. Entomopathogenic fungi as plant growth enhancers. 47th Annual Meeting of the Society for Invertebrate Pathology and International Congress on Invertebrate Pathology and Microbial Control, August 3-7, Mainz, Germany, pp. 103-104. Golo, P. S., W. Arruda, F. R. S. Paixão, F. M. Alves, E.K.K. Fernandes, D. W. Roberts, and V.R.E.P. Bittencourt. 2014. Interactions between cowpea plants vs. Metarhizium spp. entomopathogenic fungi. 47th Annual Meeting of the Society for Invertebrate Pathology and International Congress on Invertebrate Pathology and Microbial Control, August 3-7, Mainz, Germany, pp. 104. Vega, F. E., F. Posada, M. C. Aime, M. Pava-Ripoll, F. Infante, and S. A. Rehner. 2008. Entomopathogenic fungal endophytes. Biol. Con. 46:72-82.